Why More And More Women are Developing a Love Of Stand Up Paddle Boarding? While both men and women enjoy engaging in active lifestyles, you can walk into almost any gym in the country – of any type – and be left with little doubt that men and women engage very differently in physical fitness activities. Walk into the free weight area and you will find a very sparse population of women, if any at all. Walk into the yoga studio and you will generally find a dearth of men. This is certainly not to say that all men and all women enjoy the same things, but there are certainly good reasons why SUP is gaining ground with women in particular. Here are 5 reasons why SUP is becoming a more and more popular option with women. Overall, it seems that women enjoy activities that have a health benefit rather than focusing specifically on the health benefit itself. Where men may enjoy a specific weight lifting exercise that will work a very specific muscle and give them a specific result that they can actually see, women on the whole seem to enjoy activities like dancing, stretching or moving in a way that provides a whole body workout – without necessarily focusing one one area in particular. SUP is an excellent way to get a significant amount of exercise through an activity that is highly enjoyable and deeply fulfilling. While men are often drawn to team sports that place them in close physical “combat” with one another such as football, rugby or basketball, women often enjoy more solitary pursuits such as golf, tennis or even just walking. Men also sometimes seem to thrive on pursuits where injury is always a possibility, where women tend to be more likely to avoid endeavors where injuries are common. Women also tend to enjoy classes where they participate with each other rather than competing against each other. Many times, when women play sports like tennis or racquet ball, they may not even keep score or forget what the score is. Their enjoyment tends to be in the activity itself, not in who wins. SUP provides an excellent opportunity for women to get together and participate in an activity that is neither competitive nor prone to injury. Much like man caves, men seem to thrive in hot, sweaty, dingy environments. Women, on the other hand, seem to be on a never-ending pursuit of light. Women tend to want to soak in the beauty of nature and seem to enjoy outdoor pursuits a great deal. There is probably no greater way to soak in the majesty of the outdoors than through SUP. There are few areas in the US that don’t have nearby natural waterways, which makes SUP a perfect pursuit in almost any area of the country. While SUP may be gaining in popularity among women, that doesn’t mean that there aren’t plenty of men that enjoy it as well. In fact, stand up paddle boarding actually originated in Hawaii in the 60’s, when surfers started standing on their longboards and using outrigger paddles to get a better view of the surf. In the 2000’s, professional surfer Laird Hamilton brought the practice into the mainstream by using SUP as a means of training in the offseason. Now there are SUP races, meetings and competitions across the country. Considering that SUP got its start among surfers, it should probably be no surprise that in some circles, SUP is even becoming an extreme sport. So, while some women may enjoy the more leisurely pursuit that SUP provides, that doesn’t mean it doesn’t have anteing to offer the adrenaline junkies among us or that it’s not an activity that can’t be shared or enjoyed by the men in your life. Whether you are fit enough for a triathlon or are carrying around 50-75 extra pounds, SUP is an activity that is easy to pick up and easy to engage in, while still providing an excellent workout. While people who are in better shape may be able to go farther distances and stay out longer, even people in poor physical shape can still SUP for long enough to make the effort worthwhile. While it may take some time to get the hang of it and require a bit of patience to master, SUP is not particularly difficult in the right conditions. If you learn in warm water on a hot day, falling off your board is not even particularly unenjoyable. Since you are on water, falling off your board is also unlikely to cause injury. When you have mastered a few basic skills and developed some core control, SUP in even choppy weather is still perfectly doable. Now if you are searching for boards fitted specifically for women, most boards are universal! Although we do have a few Yoga Boards for sale that tend to be purchased more by women than men and come in more appealing colors for women. 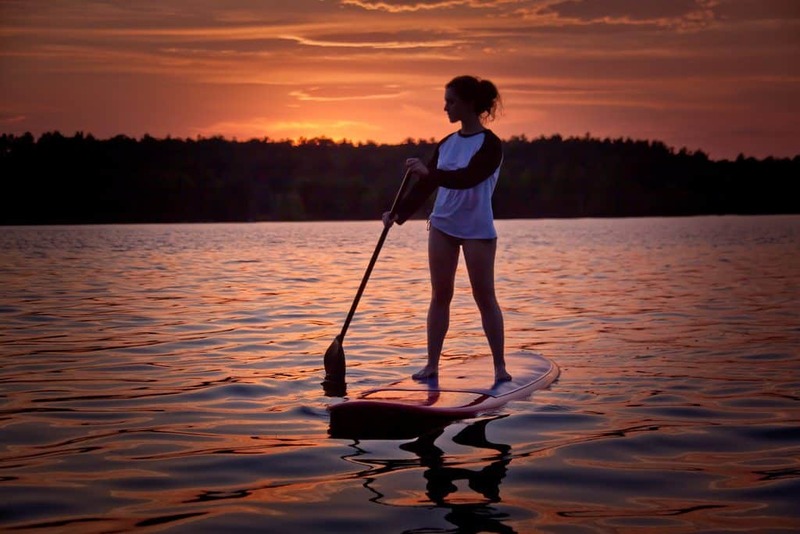 Previous Post: « How Much Do Stand Up Paddle Boards Cost?